The homeowners craved a backyard that would function as an entertaining space for visiting family members, and as a place to hang out with their school-aged children. 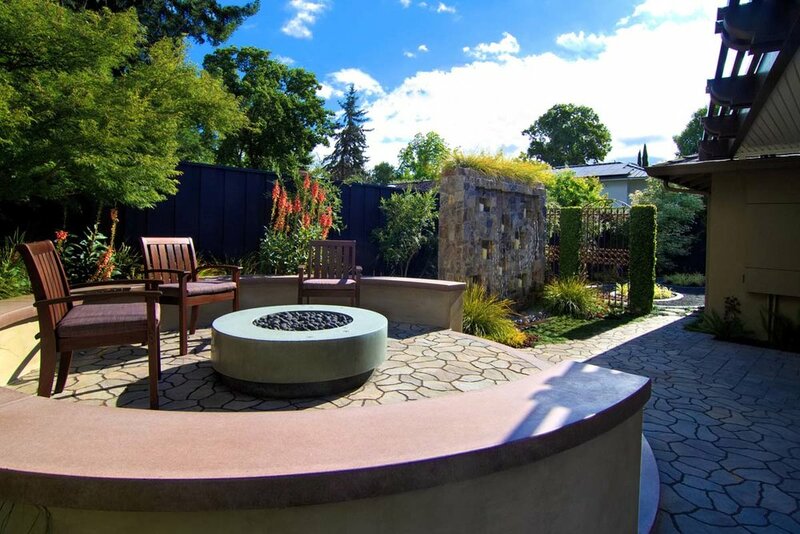 They had recently remodeled the inside of their home with a fresh, contemporary style, and we wanted the backyard to reflect this, as well. Other requests for this landscape were privacy screening, an edibles garden, container plantings, and no lawn. We fulfilled all of this, including the addition of Kurapia (a drought-tolerant groundcover) instead of lawn. 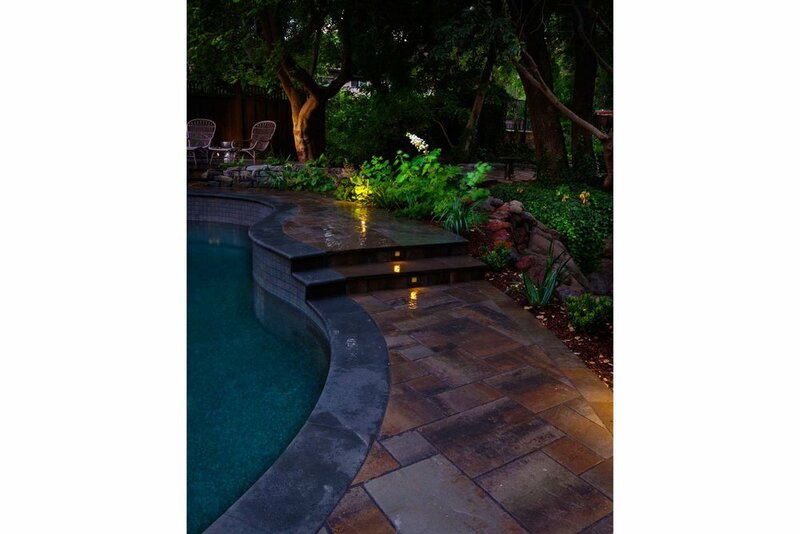 Low water, low maintenance plants soften the hardscape areas and add to the contemporary feel. This project is the true definition of bespoke: it is full of custom, one-of-a-kind features, and is a wonderful testimony to the collaborative effort between the homeowner, designer, and our installation team. The stand-out feature of the frontyard is the gorgeous water feature: the creek that runs through the yard and under the front walkway makes for a great focal point. (And, as a bonus, has become home to a family of frogs!) Colorful, easy-care plants and boulders surround the creek, and custom pavers (two kinds, intersecting) create the walkway and driveway. 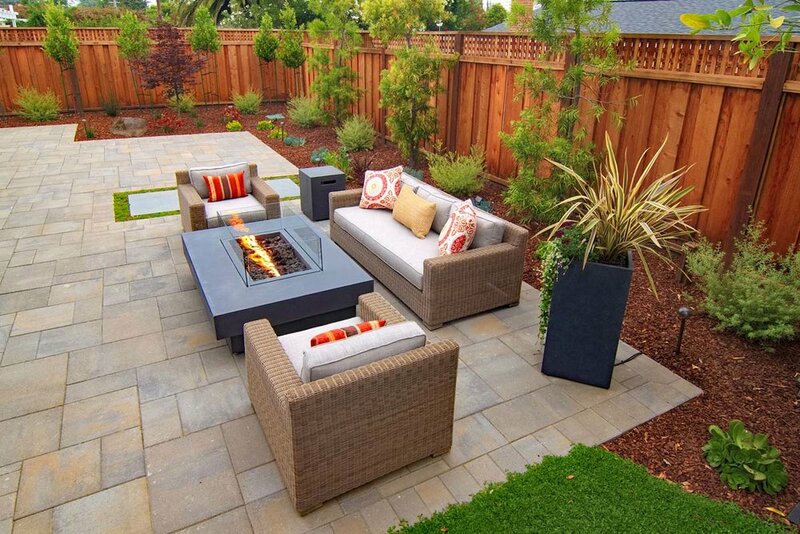 The backyard and sideyards hold even more delights. A louvered pergola covers the outdoor kitchen and dining area, complete with heaters, lights, and a fan. The louvers open and close with the touch of a button, and will automatically close shut at any hint of rain. 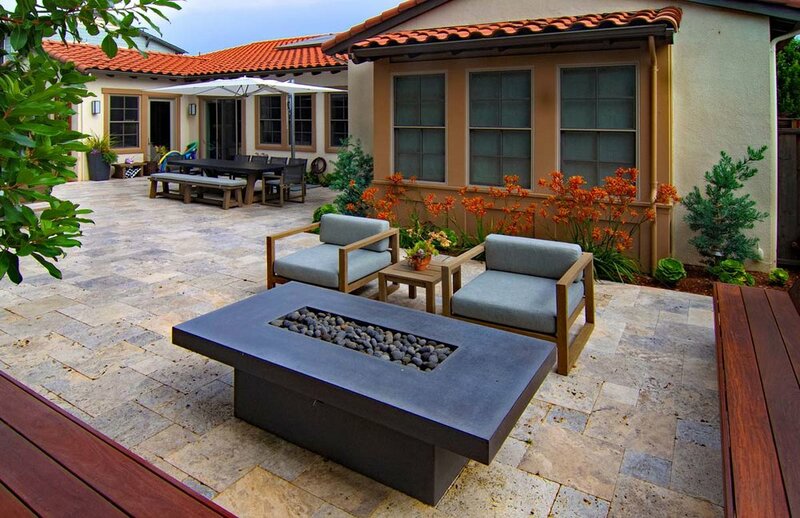 A separate raised circular seating area with fire pit is built out of concrete, with custom concrete caps and treads. A more private area awaits behind the vintage ironwork fencing: a figure-8 shaped meditation labyrinth surrounded by plants and metal sculptures, ideal for personal contemplation. However, the standout feature in the backyard is the stone “rain wall,” built with niches for flickering candles and topped with grasses. 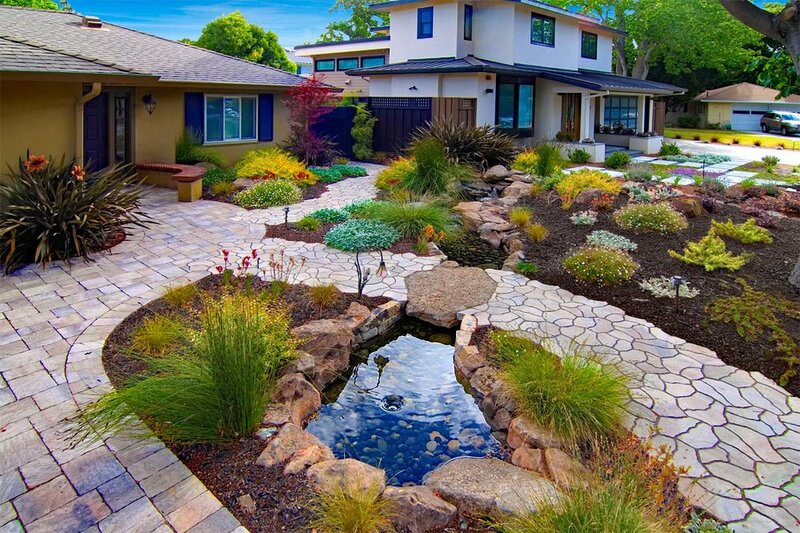 This project won multiple awards, including FIRST PLACE at the California Landscape Contractors Association - (CLCA) State Award. These homeowners had a respectable landscape to start with...some pavers, a wood pergola, and some grass. But they desired a space built for entertaining large parties, and the kids wanted a pool...so we worked our transformative magic! 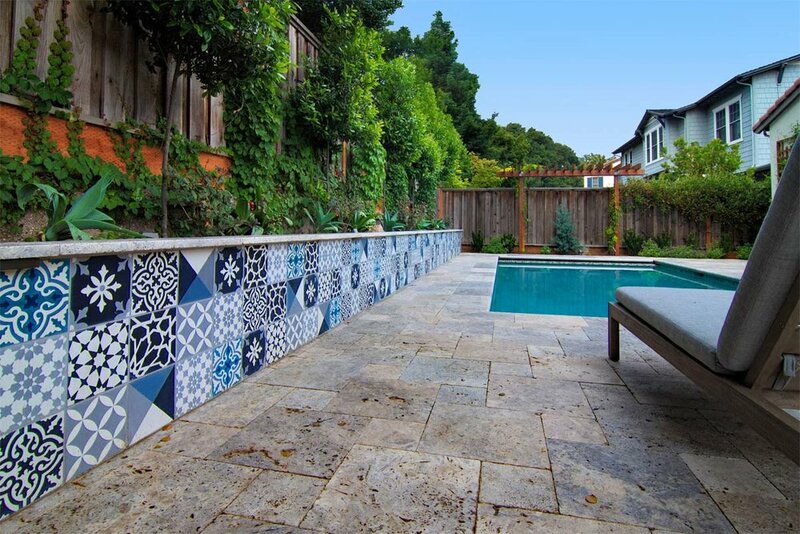 In went gorgeous silver Travertine for the flooring, a new rectangular pool, a built-in L-shaped Ipe bench around a custom concrete fire table, new retaining walls covered in on-trend encaustic tile, and an Ipe outdoor kitchen cabinet to surround the owner’s freestanding grill. Arbors and trellises add height and structure, and new contemporary pots add visual interest. Modern furniture creates spaces for people to hang out, eat, and lounge. This beautiful Tudor-style home backed up to a seasonal creek, and the backyard was blessed with many mature trees at the rear. We removed a rotting deck and replaced it with oversize concrete pavers and bluestone. We refinished the pool in an inky black hue and lined it with sparkly dark glass waterline tiles. A new small seating area was created at the back of the pool, and the pool equipment was cleverly disguised with a stone veneered candle wall. 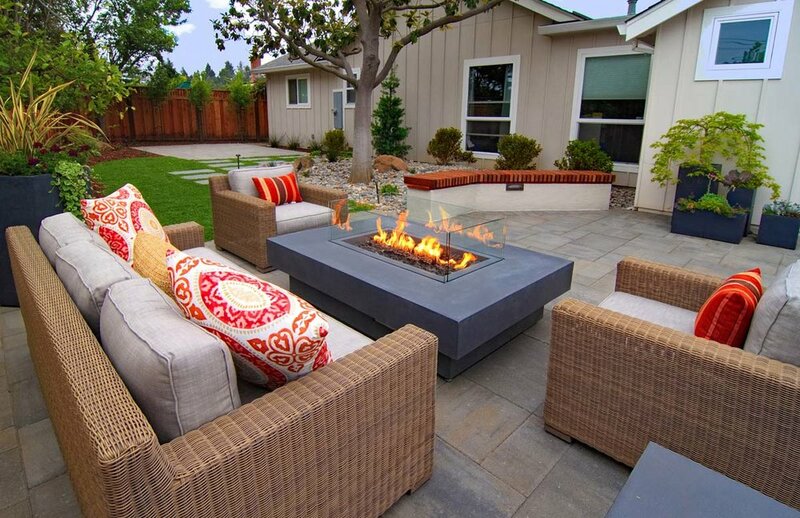 A new fire table and new outdoor furniture create areas to hang out, or to enjoy a meal al fresco. Lush woodland plantings create a magical, fairy-tale feeling. The unusual triangle-shaped lot of this property was a wonderful design challenge. Curved bluestone patios and walkways lead through the garden and create space for homeowners and guests alike. Rusted Corten steel planters contain edibles and cutting garden flowers, while brick raised planters hold ornamental trees and a small granite spill fountain. The colorful flowers and grasses bring beauty and beneficial insects to the space. Dymondia groundcover subs for law...a much more sustainable, drought-tolerant option.